The WAI is governed by volunteers from around the world who participate on leadership committees to further the mission of the association. Committee involvement offers individual members the opportunity to shape the future of the industry while they hone their leadership skills. The Executive Committee comprises up to seven members of the Board of Directors (BOD). The committee has and may exercise all the authority and power of the BOD when the Board is not in session, but is limited to the confines of the existing budget. The activities, property, and affairs of the Association are managed by its Board of Directors (BOD). Members of the BOD are chosen from among the association's active members. This committee is responsible for the interpretation of the WAI Bylaws to ensure that the activities, property, and affairs of the Association are managed in accordance with said bylaws. The Conference Programming Committee assembles the educational and technical program of the association’s annual meeting and trade show. It is responsible for identifying desirable topics and program elements, providing speakers and authors to present them, and organizing the event schedule. WAI is committed to promoting the continuing advancement of wire and cable products and processes by providing a platform for presenters to share their ideas, research, and knowledge of the industry. The Education Committee plans, develops, and manages the following, among other related products and services: conference courses, workshops, online courses, and technical handbooks. This is a task-oriented committee, and each member is asked to champion one area. This committee is in place to identify and recommend Interwire and Wire Expo sites to the Board of Directors for final approval, manage the Exhibitor Point System, and provide guidance about event marketing and exhibition floor planning. The committee is responsible for the study and review of the financial structure, changes in membership fees, budgets, long range financial planning, and capital expenditures of the association. All reports and recommendations are submitted to the BOD for consideration and review. Finance Committee members are appointed by the WAI President. This committee works with staff and volunteers to identify recruitment and retention opportunities and develop strategies to ensure a solid membership base for WAI internationally. It also provides support to chapter networks as a means of membership and program growth for WAI, including volunteer development and identification of new chapter regions to expand the association's presence. The Memorial Awards Committee is responsible for identifying candidates for the Association's highest honors: the Donnellan Memorial Award, Mordica Memorial Award, and President’s Award. 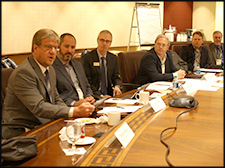 The BOD votes to select award recipients based on the packages presented about each candidate. The Nominating Committee is responsible to prepare a list of nominees for directors, officers and Executive Committee Members of the Association, which is presented annually to the Board of Directors. After BOD approval, the list of nominees for Directors is submitted to WAI members for a vote. This committee facilitates communication between WAI's education, conference programming, exhibition planning, paper awards, member relations, memorial awards, and publications committees. The committee is also responsible to recommend to the BOD the time and place of all international technical conferences. This committee is responsible to grade all technical papers presented during the calendar year, which are eligible for awards. The membership of this committee represents an equal cross section of the different industry segments (ferrous, nonferrous, electrical, supplier). This committee provides guidance with respect to design, content management, and long-term planning of the Wire Journal International, the WJI Reference Guide and the Show Program.